The RolAir 5715MK103 is capable of running on a 20 Amp breaker and delivers 7.3 CFM, doubling the output of many direct-drive units. The low-RPM pump and motor combine for a quiet operation. The pump features heavy duty, twin cylinders, single stage, is splash lubricated, High-Efficiency reed valve design, Aluminum-Alloy connecting rods, multi-finned 10" Flywheel, oil sight gauge and 17 oz. oil reservoir. 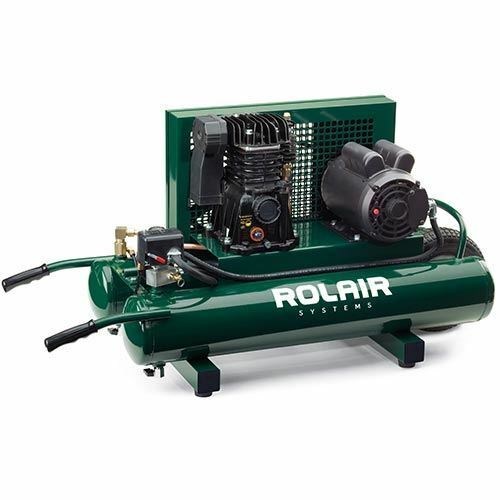 This RolAir Model 5715MK103-0165 is painted blue and comes with an upgraded intake filter. This model has dual voltage so you run both 115v or 230v/1phase. It also features dual control which gives the operator the option of running in constant speed model or on/off. Contant speed mode reduces the starts/stops of the motor, lengthening its life.